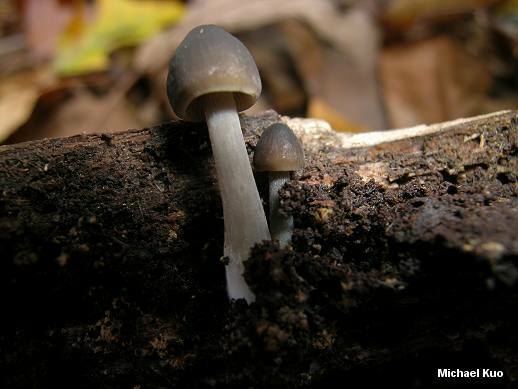 One of the larger Mycena species, Mycena galericulata is found in spring and fall, growing in clusters on hardwood logs and stumps throughout eastern North America and along the West Coast. 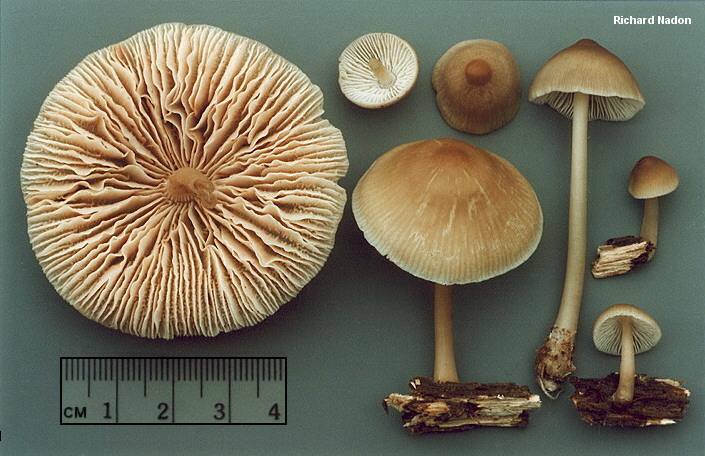 The brown to pale brownish caps reach five or six centimeters in diameter. 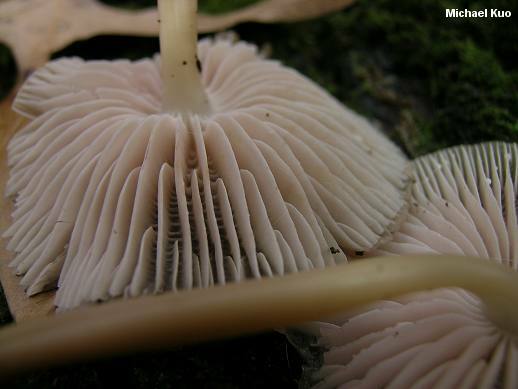 As with other Mycenas, the spore print is white--but the gills are often pink at maturity, causing potential confusion with species of Pluteus. 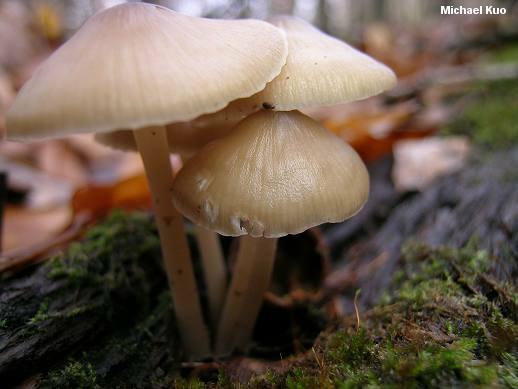 Mycena galericulata is very similar to Mycena inclinata; in theory the latter species differs in its frequently toothed or fringed young cap margin, the presence of yellow shades on the upper stem (and often the cap) and reddish brown shades on the lower stem, and its stronger mealy odor. See the linked page for further comparison of the two species, as well as discussion of other look-alikes. Ecology: Saprobic on well decayed hardwood logs and stumps (but I have found it arising from subterranean wood, appearing terrestrial); causing a brownish rot of the heartwood; growing in loose or dense clusters (but occasionally growing alone or scattered); spring and fall (or over winter in warmer climates); widely distributed east of the Rocky Mountains, and also found on the West Coast. Cap: 1-6 cm; broadly conical, becoming broadly bell-shaped and usually retaining a central bump; vaguely lined or grooved radially; bald; tacky; the margin at first even and somewhat inrolled, but soon spreading and, in age, often becoming somewhat tattered or splitting; brown to grayish brown or dirty tan, often with a darker brown center. 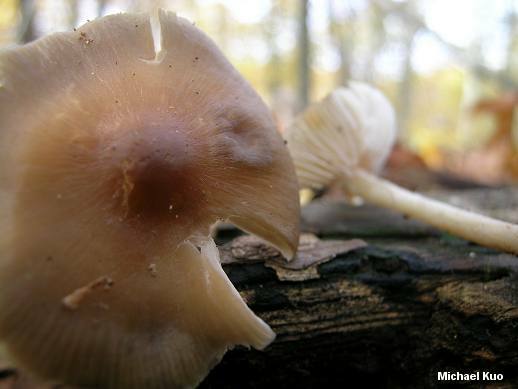 Gills: Narrowly attached to the stem; distant or nearly so; with prominent cross-veins when mature; whitish, often becoming pink in age; not bruising or staining. Stem: 5-9 cm long above the substrate, but often radicating for several centimeters; 2-5 mm thick; equal; hollow; bald, or with a few tiny fibers; whitish above, tan to brownish downwards. Flesh: Insubstantial; whitish to pale brownish. Odor and Taste: Odor not distinctive, or very slightly mealy. Taste slightly mealy. Microscopic Features: Spores 8-10 x 5.5-7 µ; amyloid; broadly elliptical; smooth. Pleurocystidia absent. 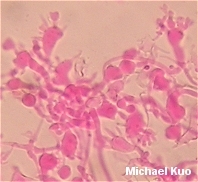 Cheilocystidia abundant; of the "broom cell" type, with rod-like projections and nodes. Pileipellis elements diverticulate, with short nodes and rod-like projections. REFERENCES: (Scopoli, 1772) S. F. Gray, 1821. (Fries, 1821; Saccardo, 1887; Kauffman, 1918; Smith, 1947; Arora, 1986; Lincoff, 1992; Barron, 1999; McNeil, 2006; Miller & Miller, 2006.) Herb. Kuo 10220402; 10270401, 11230401, 09230901.